Update from Her Turn – Our Supported Program! In February we have continued to work in Gorkha district, this time in Tandrang village. It’s a start of our cooperation with Children of the Mountain. In Tandrang we have worked with seven amazing trainers who delivered our workshop to 152 participants from Siddhakali Secondary school. The attendance rates were 97 per cent – much higher than average school attendance rate! 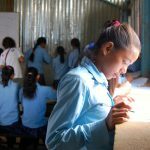 Most girls reported that their favorite and most relevant parts of curriculum were bullying, menstruation and trafficking, All of them spoke with their families, teachers and friends about what they learned and many turned out to be powerful advocates for their rights. “I told my parents menstruation is natural and normal and showed them the handouts with all the information. They now know not to burden us with heavy physical chores during our periods and that periods are a sign of health” a twelve years old participants told us. Some girls decided they will start a women’s rights organization when they are older. There is no such organization in their village, and they see the need to protect girls and women from domestic violence, child marriage and other harms. 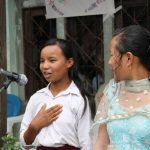 Despite low temperature and rain on the day of the community ceremony, many villagers came to see it and the girls presented speeches and plays. It was a great opportunity to raise awareness of girls’ and women’s issues and present their newly acquired leadership and public speaking skills. Check out the photos below! 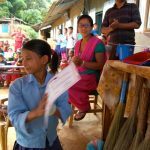 News from Her Turn – We Are Going to Gorkha! PaxWorks’ supported program Her Turn is growing!